They call themselves the “Gizmologists,” and they live to create gizmos – nifty devices that perform a function while adding more than a touch of creativity, beauty and flair. They placed their clock in the main hallway of the Engineering School’s Department of Mechanical and Aerospace Engineering, where hurried students and visitors can take a glance to see if they are making appointments or classes on time. Originally the Gizmologists intended to place their clock in a lecture hall, but its operation proved just a tad too loud for students taking exams, or for lecturers lecturing. Below, take a look at the progression of the project, from the first concepts through the finished product. The Gizmologists got their start two years ago when Gavin Garner, a mechanical and aerospace engineering professor, decided to start a club for engineering and like-minded students who might want to put their classroom learning to practical use on projects of their own design, on their own time. Engineers being engineers, several signed on, eager to build upon the knowledge and training gained in their courses. The Gizmologists include students in electrical, mechanical and systems engineering and materials science. Students in architecture, business and other disciplines have joined in on the fun as well, all working together to create devices that previously did not exist. With Garner as their faculty adviser, they have been working on designing and building several other objects, including a clock with a robot arm that moves a feather quill over pressure-sensitive LCD screens to draw out the numbers of the current time, and a boombox table shaped like a cassette tape. 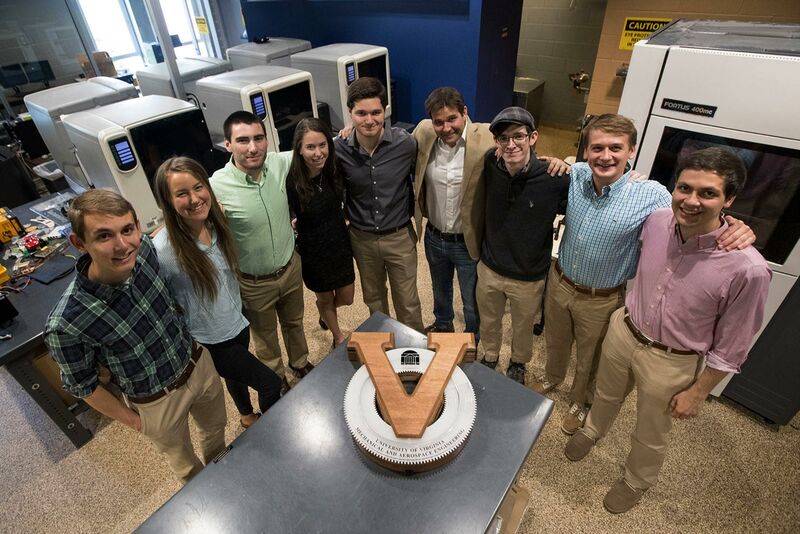 The V-for-Virginia clock is simply the club’s first masterpiece to reach completion, and was the project that started it all. Garner has won several awards for his invigorating and inspiring teaching, given by both his department and the School of Engineering and Applied Science. A Richmond native, he earned his master’s degree and Ph.D. in mechanical and aerospace engineering at UVA, and developed a love for teaching as a graduate teaching assistant. Garner’s own interest is in robotics, otherwise known as mechatronics, which brings together the principles of mechanical, electrical and software engineering. He played a key role in setting up the Engineering School’s Advanced Manufacturing Lab, which provides students with the tools needed to make what they imagine, fusing theory with practice. There, students can operate laser cutters, computer-controlled mills and routers, 3-D printers and water jets that can sculpt metal. The Gizmologists have signed their clock and designed it for easy disassembly and reassembly so future students can keep the clock well-maintained.